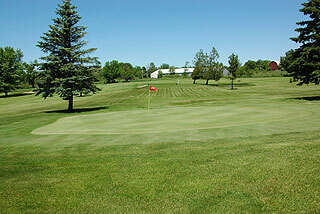 Firefly Golf Links is the oldest golf course in Clare County, expanded to am 18-hole facility in 1992 after originally being designed as a nine hole layout. At just over 6000 yards from the tips with a slope rating of 132, golfers may get a false sense of confidence when playing this course. First time visitors will be in for a few surprises however. The best tip we can offer is to take a look at the hole diagrams on the scorecards, and pay attention to the checkered flags on the fairways and near the greens - as they indicate water hazards . 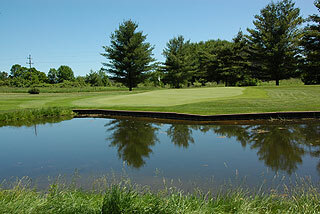 These small ponds are not ready visible from the tee areas, and are sometimes difficult to ascertain even on the approaches. This is particularly true on the par four second, and on thirteen - where the hazard winds around the left side of the putting complex. Speaking of the greens - the first few are quite simple, though less than medium in size. As golfers progress through the round however, it will become apparent that that there are some subtle slopes and crowned greens that will challenge even the best short game players. This is especially true on the back side. The front nine provides a good mix of tight tree-lined and wide open fairways, allowing for golfers to use a variety of clubs off the tee, including the driver. It certainly is possible to be left with wedges to the greens on the second shot on a number of holes. The fifth and eighth present very good birdie opportunities. 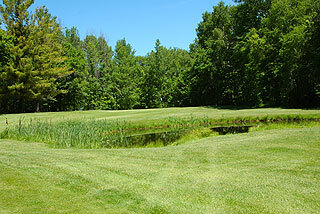 Number 4 affords little room for error, and is best played with an iron or 5 wood off the tee. 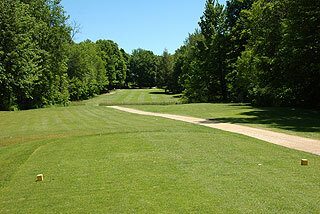 The par three 7th is also quite tight, although there is a bit more room greenside than it appears from the tee. A grip it and rip it mentality will serve well off the tee on ten, and the twelfth is a 412 yard dogleg right which requires a tee shot that breaches the 170 yard area for a clear shot at the green. From here on, the driver is best left in the bag. As mentioned earlier, a tricky, almost blind water hazard, plus three pines trees on the left spell trouble for anything hit to the left on the approach on 13. The most interesting two holes on the course follow. 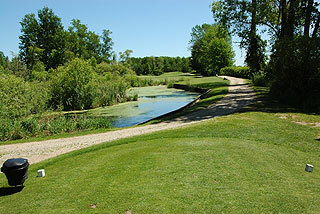 The par three 14 is beautiful from the tee, but is very difficult from the back tees. 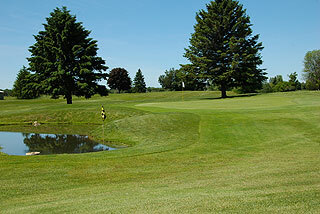 Long is gone on this hole, as a marsh rests behind and to the left of the sloping green complex. Fifteen is a crazy par five that is best played with a long or mid iron off the tee- just to land it in the fairway between the two tree lines - nothing to be gained with distance here. From the middle or left center of the fairway, the second shot can be hit for all its worth - as long as it lays up a good 40 yards in front of the green. A water hazard is situated directly in front and to the right, with the left side wide open - presenting a good bail out area on the approach. Long is definitely better than short. A recommendation - before hitting the approach, drive (or walk) up to the top of the hill, and take a look at what you are dealing with. 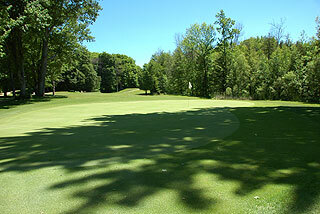 Firefly is a tremendously fun golf course, and affords a serene experience with abundant native wildlife.. It is a great value (priced below $42 including cart prime time), and can be walked at anytime. 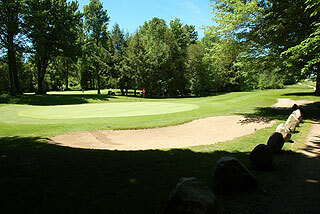 There is a practice green but no range, and the clubhouse features a small pro shop plus the Brassie Lounge with a hearty sandwich menu, cocktails, beer, wine and soft drinks. Three sets of tees measure 6012, 5190 and 4588 yards. Red, white and blue flags indicate the day's pin placements, and 100/150/200 yards stakes are visible on all par four and fives. Enjoy the mildly undulating terrain in this secluded environment, and pay attention to the checkered flags near the ponds (on 13 holes). For more info and for a link to the Firefly website, visit our page on our Michigan web catalog of courses to play by clicking here.